Fantasy fan? 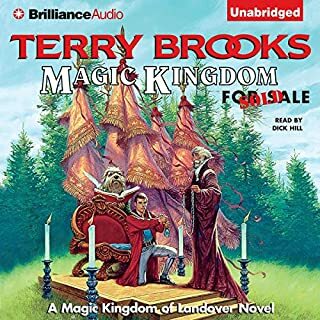 Listen to more in the Malloreon series, which is the sequel to David Eddings' Belgariad series. ©1987 David Eddings (P)2004 Books in Motion. This recording is produced by arrangement with the Ballantine Publishing Group, a division of Random House, Incorporated and David Eddings. Would you consider the audio edition of Guardians of the West to be better than the print version? It's been a long time since I've read the Guardians of the West but I think I'd say yes to this. It's an easy read and it makes for an easy listen as well. Having the various characters' dialogue come alive is quite nice. The dialogue is probably the best part of Eddings' writing so it really works well as an audio experience. What other book might you compare Guardians of the West to and why? 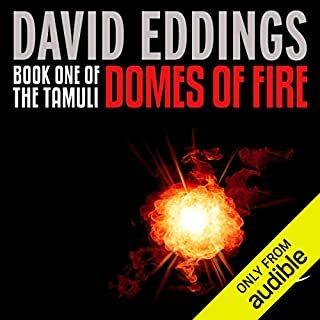 Well let's be honest - The thing about David Eddings is that one book is pretty much like another. 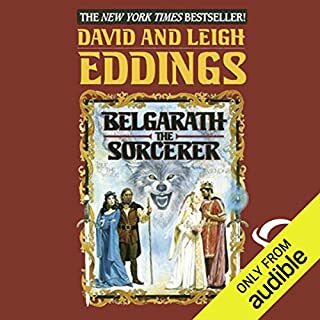 If you've read or listened to the Belgariad well then, here's more of the same. If you've read or listened to his Sparhawk books then here's more of the same - only more young adult than adult (not that that's a bad thing) and more side stuff going on (because the series is 5 books instead of 3). What about Cameron Beierle’s performance did you like? There comes a point in a book like this where you realize - wow there are a huge number of characters in this book and the reader is doing all of them by himself. He also does a good job of defining accents for each of the various peoples of the world. It's not perfect - in particular the voices of Belgarion and Errand often sound the same to the point of confusion - but it's not a huge problem. Eddings' fantasy series are, above all else, fun. This is his second seriers with these characters and could more rightly be considered book 6 of 10 instead of 1 of 5, though you could start here if you wanted to. On problem for some could be that at this point in the story some old characters you may love have to fade into the background and some new ones step forward to take their place. I personally miss some of the old characters who are relegated to bit parts, but the new characters Eddings gives us do tend to be far more interesting than what we had in the Belgariad and add a lot in diversity to the cast. 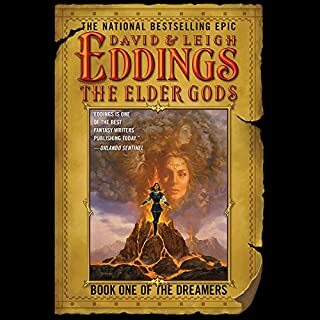 Picked this one up on sale - big fan of all things fantasy from Tolkien to Patrick Rothfuss and I'm not sure how David Eddings slipped under my radar for so long. Thoroughly enjoyed this novel beginning to end. Also the first Cameron Beierle narrated audiobook I've listened too - impressive narration. What did you love best about Guardians of the West? The story started slowly but I fell in love with all of the people who inhabit the pages. With each new book you learn more about everyone. By the end of the series you know everyone and they are like old friends. The print version lives happily on my bookshelf. Good book. I felt the narration was good. The first half of the book was a bit slow but got pretty good as it ended. I understand this was the setup book. If you can make it past the first half you will enjoy the rest of this book and most certainly the series. I like how he puts accents on the different characters depending what country they were from. I would recommend this but give it a chance. The story and the reading were both excellent. My only complaint is that the recording seemed to put a lot of emphasis on the higher pitched sounds (particularly when the reader read the letter 's'). The contrast was so great that I had to turn the volume up and the treble all the way down in my car not to have my ears hurt a bit by the end of my commute. This was a slow starter, but the rest of the series makes it worth it, even though it is a long series, and probably could have been shortened by a book, it is a great series. The reader is a good story teller and brings the characters to life. In short, even though some sections get a bit tiresome, the whole is worth it. Hated the narration/acting. Every character had every accent the narrator used at different points in the book. The books themselves ( 2- 5 book series..." The Belgariad and The Mallorean") are terrific! Probably my favorites of all time, in any genre. Everyone decides how to pronounce fictitious names/places/etc....but I was extremely disappointed in how they chose to pronounce countless things in the stories.....the same with some of the accents given to characters. It was bad enough that I fast forwarded parts because of the accents. I STRONGLY recommend the books themselves! The storyline is very strong, and the story TELLING is even more so! Maybe it wont be a big deal to you if you havent already read them. I am very interested in hearing thoughts from those who HAVE read the books....to see if it's just me, or if the acting and pronunciation was as terrible as I believe. Davis Eddings is a fantastic author. And the audio book brings the characters to life. I love the entire series. The Guardians of the West picks up almost immediately after the end of the Belgariad. It's been a few months since Garion and Ce'Nedra's wedding, and the young boy Errand find himself moving to the vale with his new adopted parents Durnik and Polgara the Sorceress. The group is accompanied by the vagabond sorcerer, Belgarath. After he and Polgara spent thousands of years working to see Torak and the Dark Prophecy defeated, they think they can rest. But hints and rumors begin to stir of a new force awakening in the east while the Angeraks struggle to come to grips with the death of their god. Over the next five or so years, Garion and Ce'Nedra settle into their married. With a few bumps along they way, they grow to find a balance in their relationship. A balance that is disrupted when Ce'Nedra's lack of pregnancy begins to worry the other monarchs of the world. Stability is needed for the world after the trauma it's endured, and there are those who seek to take advantage of it. 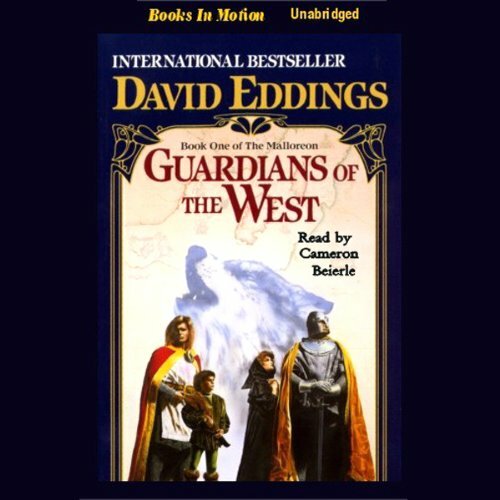 Guardians of the West is a great follow up to Eddings outstanding Belgariad. He returns to his world and spends an entire book on the buildup to the new threat. He's subtle, showing us our characters as they fit into their new roles in life, growing into full adulthood (like Garion and Ce'Nedra) while shifting many of Garion's story role onto Errand's shoulders. For fans of the Belgariad, it's a great reunion with old friends. The build up is handled well. It's a mystery that has you, thinking you already know everything about the world, wondering what is going on. That moment of realization that there is more to “Boundless Mallorea” than that little slice we saw in Enchanters End Game. The misdirects and the plot twists are great. Guardians of the West is like the first few chapters of Pawn of Prophecy stretched into nearly a whole book. This is a great start to a new series with our old character. Eddings has to do little retconning to make it work, just tweaking the expectation that the final battle wasn't as final as everyone (our characters included) believed. It follows on those dangling plot threads left over from the last series while setting the stage for the new adventure to come. If you enjoyed the Belgariad, then you have to read the Mallorean! Cameron Beierle is flawless and makes the story truly timeless. I hang on every word! Great story if you can get past the sometimes Pythonesque or chim chimeney accents by the narrator. I have listened to this story many times as I use it to help me fall asleep. It is well read and remains enjoyable - whether sleeping or awake. I still often play it again during the day just to follow the story a bit more. 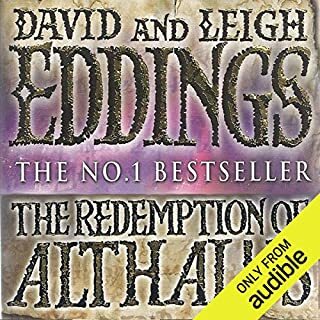 I am afraid although I love David Eddings and Belgarath this is a book that I will have to read myself. The narrator sounds more like a computerised voice. For me impossible to listen to. An excellent well placed story that unlike some of the Belgariad always feels like it's going somewhere and never stalling. Somebody sack Cameron Beierle! The man has no clue about intonation, pacing or punctuation. This dreadful recording spoiled the book. The story continues from where we left off after the Belgariad, building on the picture of the main characters lives and sowing the seed for this next epic adventure. Enthralling story, engagingly read by Cameron Beierle, throughly enjoyable listening. I was so happy to discover my favourite books in the audible store. Listening to somebody else read the book too some getting used to but very much well worth the effort. I now have all 12 books of the series. Our whole family listen at bed time. second time round and still on edge. Good follow up to the last series, barely any repetition in the story's plot, and still thoroughly enjoyable. The narrator keeps pronouncing quay as "kway" it's "KEY" not kway!!! It's very off putting. This reader not only mispronounces words but is inconsistent with some of those wrongly pronounced words. Unfortunately I must put up with his apparently poor education to hear the rest of the story. 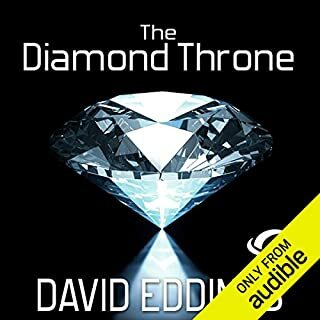 David Edding books are my favorite books ever have read them for year but now that my eyes are so back glad to be able to listen to them and enjoy them again. love love them. I enjoy the series. Pronunciation worries me at times saying "off of" is incorrect English. Very good book and the narrator is excellent. Very easy to listen to. All the different accents makes it very easy to follow the characters.